Or, make a few adjustments around the home to ensure it’s toddler-proof against little hands and big accidents. The statistics surrounding this topic are sobering. According to Kidsafe Victoria, more than 80 per cent of homes offer easy access to poisons such as medications, detergents and chemicals, while 75 per cent of safety gates and barriers were installed incorrectly, creating tripping hazards. As a consequence of these types of oversights, two children die in Australia every single week from preventable injuries. It’s something of a no-brainer that electrical outlets need to be made off-limits to little fingers that like experimenting with new textures and environments. Either cover them with specific child-safety devices or be extra vigilant in warning your toddler not to touch if they wander near them. If you live in a two-storey house, make sure you’re aware of the rules and regulations surrounding stairs and balustrades. KidSpot.com.au reports that you must have a railing on stairs, balconies or verandahs that are higher than 600 millimetres (60 centimetres), while the balustrade on stairs must be at least 865 millimetres (86.5 centimetres) high — unless the drop is greater than 3 metres, in which case the balustrade must be at least 1050 millimetres (1.05 metres) high. 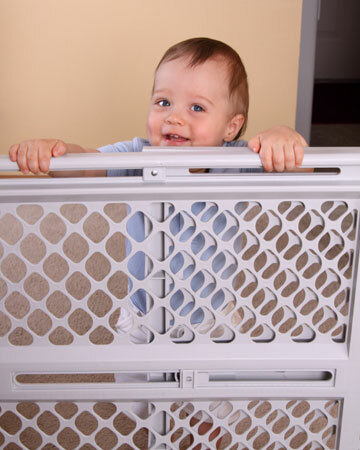 Many experts also recommend that you install a lockable baby gate at both the top and bottom of the staircase. What may seem benign to us grown ups — a bottle of dishwashing detergent stored below the kitchen sink, or a packet of headache tablets stashed in the third drawer — can represent dangerous hazards to your toddler. Be sure to store anything that your little one could ingest out of their reach, whether it’s in the kitchen, bathroom, garage or in shed. It made headlines around the world in 2009 when world champion boxer Mike Tyson tragically lost his 4-year-old daughter, Exodus, after she became tangled in a cord hanging from a treadmill. This horrific accident highlights just how important it is to ensure that cords are always kept tucked away and out of reach of tiny hands, whether they’re hanging from blinds, curtains, exercise equipment or electrical appliances. Sonja Gerdtz, founder of babyproofing business Home Car Safe in Geelong, says the now-ubiquitous big screen TV poses a large safety risk to young families. “Data shows the most common ways children are being injured is by doing such things as moving TVs to reach behind cabinets for toys, and pulling out bottom drawers of tallboys to reach up and press buttons on TVs, thereby causing them to topple,” she says. “As we all know, these things can happen in an instant but the serious injuries that can result, can last a lifetime.” A TV safety strap is a simple and effective way to lock your set in place and avoid this needless injury. These are just some suggestions of ways you can toddler-proof your home; for an exhaustive list of household issues you may wish to consider, review the Royal Children’s Hospital Safety Centre “Home Safety Checklist” here. Help! My toddler won’t eat… anything!